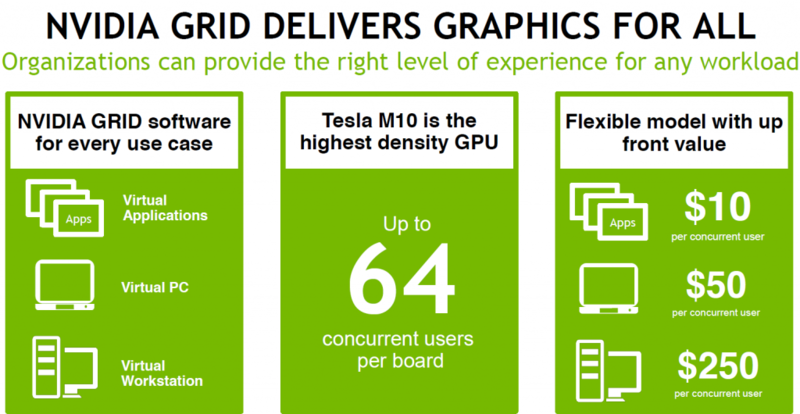 NVIDIA have today released a new product to the GRID TESLA family, I welcome the new “M10” GPU. The product will be available in August 2016, if you attending Citrix Synergy next week in Las Vegas you will be able to try out the new M10 in the NVIDIA booth. The M10 is the perfect GPU for high density so now NVIDIA can provide GPU4all. Latest version of Windows delivers fast user experience and the GPU is a very important component to deliver the rich graphics, the same thing is with Microsoft Office 2016. Graphics editor such as Adobe Photoshop, Illustrator, Premier and last but most important Internet Browsers such as Microsoft Edge, Google Chrome, Mozilla Firefox, Opera. The browsers are using GPU compute and GPU memory and the M10 is a great GPU for providing graphics goodiness and help companies accomplish a faster workspace with fast responseness reducing the time to wait and work from any place, this is the great value of GRID. 2013, NVIDIA released the GRID K1, and K2 and last year NVIDIA released M6 and M60 which was replacing the K2 and now the K1 have found its replacement GPU which is the M10. The M10 have 4 GPUs on 1 board, which is same as K1. The M10 have 8GB framebuffer which M6 and M60 also have but M10 have lower GPU compute which is 640 per GPU total 2560 in one M10 board. M6 have 1536 GPU compute and M60 have 2048 GPU compute per GPU and total in one M60 board 4096. This means the better you understand how the behaviour is of your app using GPU compute, then you know how to buy the correct TESLA GPU for your company. I made a different specification between K1 and M10 so you can see how better the new M10 will be when its available. 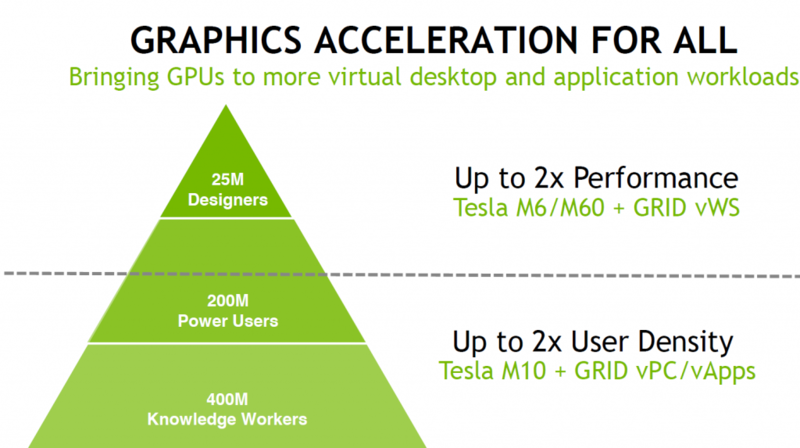 Lets look at what NVIDIA offers and what GRID 3.0 is and which GPUs you can buy for your company. If you require Quadro functionality/OpenCL/CUDA, which is typically CAD/CAM/CAE apps, then M6/M60 is the perfect GPU for that requirement. “The future of work requires responsive applications that deliver a rich user experience for any application, on any device,” said Calvin Hsu, Vice President, product marketing, Windows App Delivery, Citrix.“This latest version of NVIDIA GRID, takes virtualization to a new level. Together we enable IT departments to gain real value and performance from their datacenter and business application investment. “The new Tesla M10 enables GRID capabilities at an unprecedented scale, and will be the game changer for cloud delivery of an even wider range of rich applications from data visualization to creative apps like Adobe Photoshop,” said Nikola Bozinovic, Founder and CEO, Frame. “A massive shift is underway in end-user computing causing IT organizations to evaluate technologies such as the Nutanix enterprise cloud platform and NVIDIA GRID to deliver superior end-user experience to their organizations,” said Venugopal Pai, Vice President, Global Alliances and Business Development at Nutanix. “We are excited to partner with NVIDIA to support NVIDIA GRID offerings on Nutanix enterprise clouds to tackle even the most demanding end-user and modern applications like Windows 10.
ficiency for power users and knowledge worker workloads,” said Wally Liaw, Sr. Vice President of Sales at Supermicro. “In addition,our complete GPU SuperServer line offers the industry’s highest density and widest range of form factors optimized for NVIDIA Tesla GPU Accelerators, lowering overall CAPEX and OPEX across virtualized enterprise environments. is a key part of today’s digital workspace, where today’s mobile workers require greater flexibility to be productive in any location, and on any device. VMware Horizon with NVIDIA GRID allows IT to accomplish all of this, for any worker, wherever they may be, all while delivering a first-class experience that can easily scale.